During 2018, a confluence of market and technology forces created turbulence in the satellite industry. On the technology side, the space sector is pushing for substantially more productive satellite infrastructure and ground segment at a lower cost. 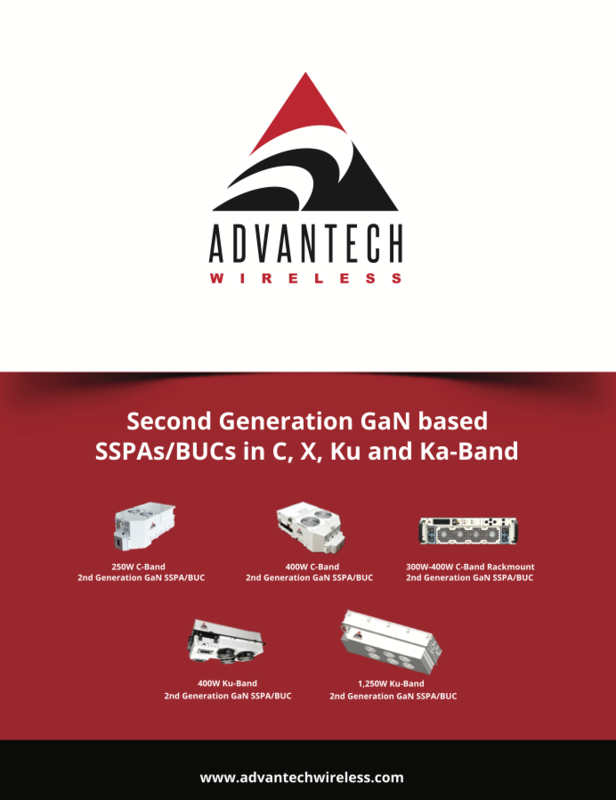 The introduction of HTS systems is resulting in significantly more satellite capacity and higher bandwidth for end users at a reduced cost per bit with this trend expected to intensify in coming years. On the market side, the satellite industry is increasingly embracing the changes to the ICT sector, with requirements of broadband connectivity “anywhere, anytime” opening new markets, while challenging its legacy businesses. This is obliging satellite operators to reposition their investments toward new growth segments, with the satellite market progressively shifting from video to become increasingly data centric. As HTS systems are best positioned to address the majority of telecom demand, HTS capacity revenues are projected to progressively grow and surpass regular FSS capacity revenues within a few years. The turbulence mentioned above is having an impact on players across the value chain both upstream (manufacturing and launchers) and downstream (operators and service providers). On the upstream side of the value chain, uncertainties are pushing satellite operators to limit or delay orders of satellites. This can notably be seen with the number of GEO commercial satellites ordered in 2018. As of November 2018, eight GEO comsats had been ordered since the start of the year. 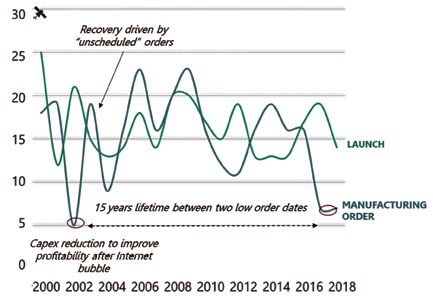 This follows the low point of 2017, when seven satellites were ordered (lowest total in the past 15 years (see Figure 1) and indicates there is a change in strategy for commercial FSS operators. Future orders will be increasingly dependent on replacement rates and the competition from NGSO constellations. Innovation and flexibility are two of the key words in the industry in 2018 to optimize CAPEX and mitigate uncertainties. Innovations are changing the economics of the industry in several ways, with this truer than ever in 2018. This is confirmed by the fact that HTS flexible comsat payloads have become an economic imperative for satellite operators looking for improved efficiency. The industry is also increasingly privileging the use of Electric Orbit Raising (EOR) which results in lower launch costs. Also worth highlighting is that market uncertainties are boosting the interest of SATCOM operators for In-Orbit Servicing (IOS). Through IOS satellites, operators are seeking to optimize investment and risks. Three customers have contracted IOS, including Intelsat and SES. The first demonstration mission is scheduled for 2020. The future of the GEO comsat market was itself in question during 2018 (size of satellites, life time, servicing) and manufacturers were forced to adapt and diversify from GEO for their business to remain relevant. Manufacturers are increasingly implementing strategies targeting cost reduction and production efficiencies to adapt to customer requirements in terms of price and time delivery. Centralization of production, standardization across product lines and new manufacturing processes have been adopted by most manufacturers. The focus in 2018 for manufacturers has also increasingly shifted toward building smallsats in a viable economic model and adapting their complex manufacturing capabilities into very rapid and simplified systems. This was confirmed by Maxar Technologies, which mentioned in the summer of 2018 that it was considering divesting or shutting down its geostationary manufacturing line as a result of an order drought. In parallel, Maxar announced in July 2018 that it was setting up a new organization focused solely on smallsats. With the changes in the industry, the smallsats market is going through significant expansion in terms of capabilities and demand. 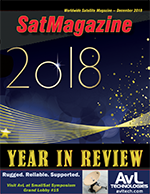 After 201, which was a record year in terms of smallsats launched (330), the market is not expected to slow down much in 2018, with approximately 300 smallsats to be launched by the close of the year. • Satellite capacity is increasingly becoming a commodity product, resulting in rapidly falling capacity ARPU (Average Revenue Per Unit) globally. The arrival of HTS capacity, and overall of larger supply, has set new price references in the different segments and geographies. In parallel, the increasing maturity of certain services including TV broadcasting have made customers more cost sensitive and eager to optimize their transmission costs. One of the consequences is the structural move of many operators and organizations to more integrated services. A growing number of satellite operators (e.g., SES) are transitioning from wholesale bandwidth suppliers to managed service providers to increase the value added and avoid the commodity price trap. • The transformation of the satellite industry and necessary growing pains is expected to result in a decline in the wholesale market revenue in 2018 (net of the impact of some changes in reporting principles and exchange rate variations) despite a likely sustained increase in revenues from HTS capacity. • New preparation milestones were reached in 2018 in regard to the larger availability of GEO VHTS platforms and the deployment of several “Terabit” NGSO constellations. In Europe, the signed agreement between Eutelsat, Orange and Thales for the Konnect VHTS program is evidence of this trend. Considering NGSO constellations, some progress was made in 2018 in terms of financing and regulatory achievements; however, there remains a great number of uncertainties for 2019. On the service provision side, 2018 was the year of satellite connectivity. Mobility services in particular were dynamic during the course of the year. Leading service providers started to leverage the commitments they had made for multiple Gbps. As an example, Gogo started to use SES-14 capacity on 200 aircraft as soon as the HTS payload became operational. To a larger extent, all the aero IFC service providers have released new generations of their services, such as 2Ku for Gogo or XTS for Panasonic Avionics that will take advantage of the HTS satellites recently or currently deployed. An identical pattern was observed in the maritime sector, with an even larger diversity in the requirements from the largest cruise ships that are now targeting hundreds of Mbps to the various types of merchant ships, support vessels and others. Outside of mobility services, a set of contracts and network deployments were disclosed in 2018 by different operators and service companies for cellular backhaul and, to a larger extent, broadband access. In advanced communication markets, the rollout of extended networks by Sprint and T-Mobile in the U.S. reveal how new solutions can contribute to the geographical extension in mobile coverage in order to follow mobile subscribers and offer a seamless 4G experience across territories. In emerging countries, a combination of initiatives is being observed, from the WiFi community approach developed by Viasat in Mexico to government programs, and the extension of cellular networks to remote sites aiming at bringing services to the local populations (e.g., expansion of capacity commitment by Vodacom in Africa). In parallel, a lack a dynamism was once again observed for TV broadcasting services during 2018, leading to an expected decrease in capacity revenues and limited growth in capacity usage. This is notably due to the limited number of new services launched and the progressive end of SD/HD simulcasts in a growing number of countries that include the U.S. and South Korea. Simultaneously, the number of satellite subscribers should continue to decrease in mature markets in 2018 as households increasingly cut the cord to privilege OTT services. The U.S. is expected to be the most affected. During Q3 of 2018, the country’s two DTH platforms lost a combined 726,000 subscribers. For 2019, Euroconsult expects to witness some uncertainty in the SATCOM industry as market players continue to adapt their strategy to the deep changes that have impacted the market in recent years. The improved value proposition of satellite connectivity, driven by the fast-increasing digitization of the ecosystem, should meet with the requirements of a larger customer base, enabling the rollout of new communication services. This, however, will not necessarily mean that SATCOM revenues will grow in 2019. With the time for the new business opportunities to overcome the impact on legacy infrastructure, a progressive improvement is anticipated over the next two years before a more solid phase of revenue growth can occur. 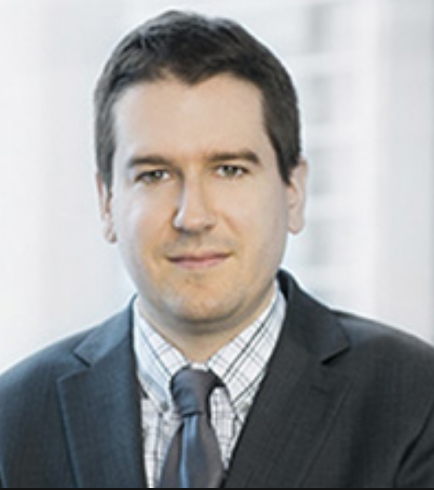 Dimitri Buchs is a Senior Consultant of Euroconsult, based in Montreal, Canada. He specializes in the digital broadcasting sector. Since joining the firm in 2007, Dimitri has worked on over 30 consulting missions. His expertise lies in analyzing market dynamics for video distribution and contribution services, regularly contributing to consulting projects and due diligence studies for satellite operators, service providers and equipment manufacturers where video broadcast is an essential part of the assessment.